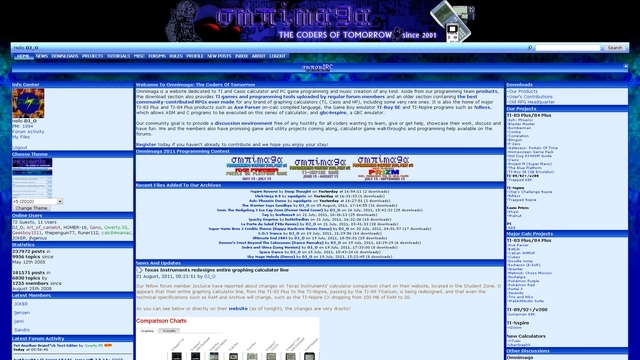 Omnimaga is an active TI community site, and it has an associated programming group called The Coders of Tomorrow (which is also the site tagline). For a while, it had by far the most active forum in the whole calculator community (including Casio and HP) and it still remains somewhat active today, even over a decade after being founded. It holds the distinction of being the only graphing calculator-related discussion forum to ever have reached 400,000 posts. That is a reflection of its wide array of features, among them TI programming, Casio programming, computer programming, and music creation. It has also moved around a lot over the years, and has been located at and used several different URLs and hosts. Its online location eventually stabilized in late 2008, while it has used the omnimaga.org domain name since October 2006, although a few more hosting moves occurred afterward. Its main language is English, but it also has French and German forum sections. Several Omnimaga programs were originally released in French too. From late 2002 to 2004, Omnimaga also had a music division called Omnidance Music, under which the founder's music was released, but it lacked a website. That music division was to be revived in late 2007 under the Omnidance Records name and even the omnidancerecords.com domain name was registered, but after Omnimaga was revived in August 2008, the project was abandoned. Omnimaga website closed down in March 2008, but re-opened in August of that year. The best feature of Omnimaga is its active forum, where you can regularly find upwards of ten or more people online at one time. The archives section houses programming tools and almost all of the RPGs that have been created by the TI community over the years. In addition, there are many projects that are being developed, including the Axe Parser, the Game Boy emulator, and Ndless, as well as many programs and games that have been released to the public. Although the website has come down from its activity peak of 2010-11, it still survives smartphones and tablets as a mostly-calculator-oriented website and you can still find regular discussion happening and new calculator releases. The site staff is broken up into those people that help with site maintenance and operation of the forum, and those people that are part of the programming branch called Coders of Tomorrow. In addition, several of the members have been involved with other TI sites and programming groups including Deep Thought (ClrHome), AaroneusTheGreat (TI-Freakware), Calc84maniac (Outside The Box Programming), Adriweb (TI-Planet), Critor (TI-Planet), ExtendeD (Hackspire), and DJ_O (United-TI, Z80 Revelation, Rivereye Studios, Hikaru Rakuen Programming, Epic Programming Studios, TI-Jon and CodeWalrus). The official Omnimaga team list on the website is outated, though, and lists some editors that have since stepped down, which the list below omits. Because of high activity requirements from 2008 to 2011 (administrators, moderators and coders of tomorrow had to post at least 10 times per month, a requirement later inherited by CodeWalrus) and stability issues from 2006 to 2008, Omnimaga has a lot of retired staff members who either left due to being unable to meet the activity requirements of the era or due to other issues, so this list is quite long. From 2009 to 2014, Omnimaga was really the epicenter of activity in the TI community and during other years it was among the top calculator websites in terms of activity. It is involved in lots of projects on the TI through its programming group The Coders of Tomorrow, including the aforementioned Axe Parser, Game Boy emulator, and Ndless. It also bridged the gap between the TI and Casio communities by getting Casio PRIZM hacking started and even was affiliated with Planète-Casio from September 2011 to March 2014. Although today Omnimaga is no longer as active as it was back in 2010 and 2011, where the forums averaged at over 350 posts a day, it still gets new messages everyday and the IRC channel #omnimaga has a large amount of activity. On the website you are guaranteed to see new project updates on a regular basis. Its original goal of being the RPG headquarters for the TI community not only has allowed it to archive almost all of the RPGs that have been created by the TI community over the years, but also helped make it become the de-facto place to announce your upcoming RPG projects. 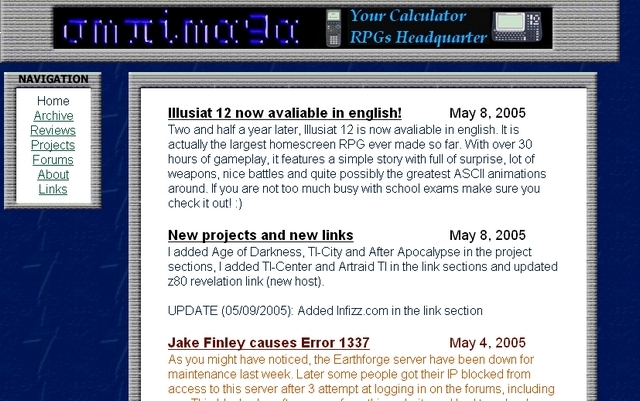 One of the motives for starting a calculator website about RPGs was that back then, ticalc.org ASM and BASIC game folders were not split by genres and text-based games were bundled with the rest, which made it extremely difficult to find an RPG of decent quality. The site then expanded towards other game genres after the Coders of Tomorrow group, mainly consisting of TI-BASIC and xLIB programmers, was formed in December 2005. After multiple failed attempts, it eventually expanded successfully towards Z80 assembly development, Casio discussions and computer development in 2010, although it did have occasional computer projects and releases beforehand. 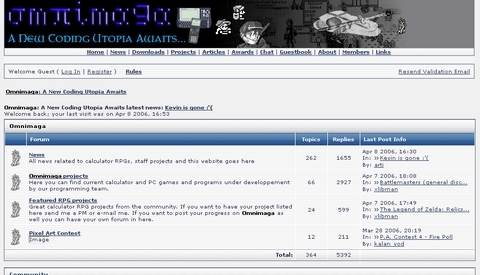 Due to ticalc.org splitting their game categories into multiple directories between 2006 and 2008, the RPG section of Omnimaga became obsolete and it eventually became read-only, while a new archive where members can upload games and utilities of any genre got implemented. That section eventually became read-only in 2014 as well. The site was known for its strong stance against hostility towards other people from 2005 to 2013, which was reflected in the strict forum rules that each member are required to follow. In addition, the founder, Kevin Ouellet, has had some public and private disputes with community members at other sites, including Cemetech, United-TI, CalcGames, and TI-Basic Developer, due to his 2005-2009 campaign to convince other site owners to take the same stance. It also led to IRC wars between members of #omnimaga and #tcpa, as both channel user-bases have opposing mentalities, which sometimes caused people to leave Omnimaga or vice-versa. At one point, Omnimaga had increasing difficulty operating under this environment and it led to its shutdown, in early 2008. However, the IRC channel remained open, mostly as a music discussion and hangout chatroom, and when the TI community tensions decreased, several former Omnimaga members started requesting a revival of the forums. At first, DJ Omnimaga did not want to take the risk of going that route, but he eventually caved in and re-opened a new Omnimaga website in August 2008. 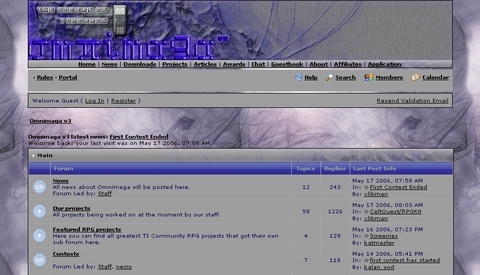 In 2009, after giving up on trying to spread the hostility-free mentality among administrators of other TI community websites, the entire focus was put on making Omnimaga more attractive to users of other websites. Despite the shutdown that lasted nearly six months, several users of other websites migrated to Omnimaga due to its atmosphere and this, combined with the arrival of Axe Parser and Ndless, contributed to Omnimaga reaching activity records during most of 2010 and the first half of 2011. They would make history in 2011 by becoming the first (and as of 2016, only) calculator forum to ever have more than 100,000 posts in a single year. In July 2011, the site founder, DJ Omnimaga, stepped down from his administrator position due to health issues and pressure from some TI community members outside Omnimaga. After DJ Omnimaga resignation, the remaining Omnimaga administrators decided to make the website, most notably its atmosphere, undergo a major change in direction. In addition to that, several portions of the website stopped being updated in the process and most staff became inactive. In 2014, controversy arose among some of the most active Omnimaga members about the lack of site updates, certain administrative decisions and new moderation policies that were instated since 2013. An initial dispute between administrators and their partner TI-Planet led to the end of that partnership that had lasted since late 2011. Then near the end of 2014, increasing tension between a group of active Omnimaga users and some administrators led to a split into another website, CodeWalrus. However, unlike the BaSiCoDeRz split from SiCoDe in 2000 and the TI-Planet split from TI-BANK in 2011, the major backlash that was initially feared between both sites did not materialize, although a site defacement incident targeting CodeWalrus occurred in August 2015, resulting into the offender being demoted from all his Omnimaga positions and banned for 6 months from CodeWalrus. Both the TI-Planet partnership ending and especially the CodeWalrus split led to a severe decrease in activity on Omnimaga forums at the end of 2014, going from approximately 1500 posts a month to 500 almost overnight, since many of the people who left Omnimaga after those two incidents (including DJ Omnimaga himself) were by far the most active posters. Omnimaga faced a similar activity decline in February 2007, when its founder lost Internet access for 5 months. United-TI faced the same problem a few years earlier, with the difference being that instead of creating a new website, the many users who decided to jump ship instead migrated to Omnimaga itself. UTI closed down in 2012 and was absorbed into Cemetech in read-only state. Due to the founder speaking French as his native language, it has helped Omnimaga establish links with some active French websites over the years, including yAronet and TI-Planet. 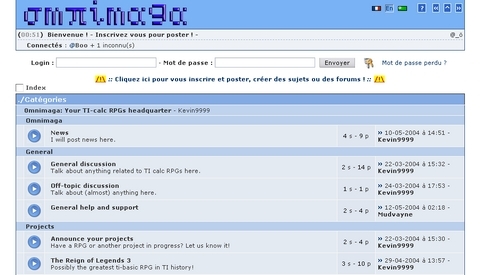 Consequently, Omnimaga had a large following amongst French users, and even has a section for calculator discussion in French (as well as German). December 2004 — Website closes due to hosting provider shutdown and lack of internet access by the founder to move it. 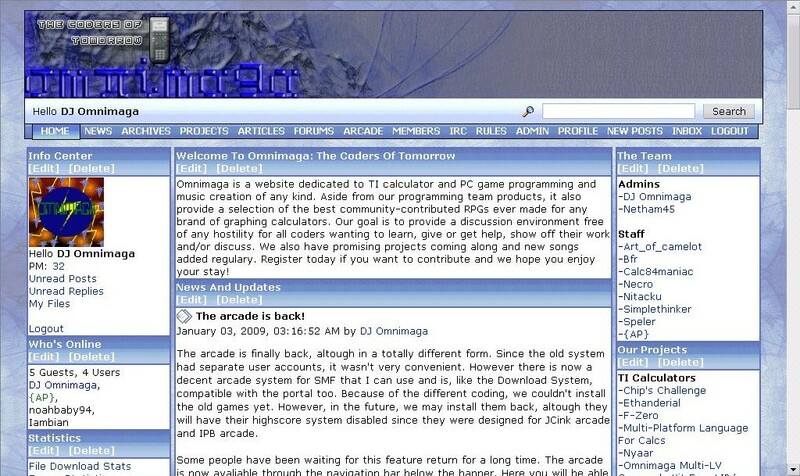 September 1, 2008 — The new Omnimaga site is re-opened to the public, although it never gets announced anywhere else in the community (members find it on their own). The word Omnimaga is composed of the word magic, prefixed by Omni. Originally, the name was chosen in a computer science class to append to each project that the founder made, and was inspired from the console RPG magic. The name was initially going to be Ultimaga, composed with Ultima and magic, but the author's brother already used it in his projects. 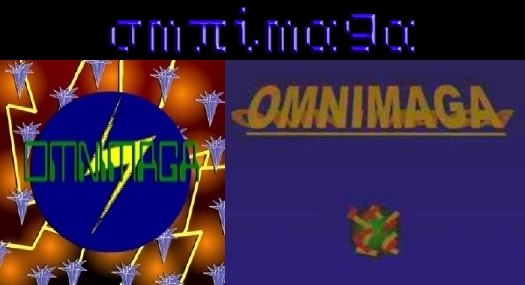 The original Omnimaga logo represented the three main Final Fantasy magic spells: Fire, Ice and Bolt. Omnimaga has had various site URLs over the years, and has got hosting through some other TI community sites: yAronet, United-TI (twice), Calc Webzine and Epic Programming Studios. Omnimaga was founded on September 1st 2001, by Kévin Ouellet (later nicknamed as xlibman, then DJ Omnimaga and now DJ_O). The word Omnimaga is composed of the word magic, prefixed by Omni. Originally, the name was chosen in a computer science class to append to each projects the founder made and was inspired from console RPG magic (initially, the name was going to be Ultimaga, composed with Ultima and magic, but the author's brother already used it in his projects). The original Omnimaga logo represented the three main Final Fantasy magic spells: Fire, Ice and Bolt. Eventually the founder started using the Omnimaga name in all his TI-83 Plus and computer projects and formed a tiny group of calculator programmers at school. In September 2002, the logo was changed to yellow text on a blue gradient background and an animated spark ball, but was never used in any game and program. In January 2003, a new logo started being used in calculator projects, then a year later, a blue 3D version was created, with slight differences on the "N" (which happens to look like a pi symbol). The 2003 and 2004 logos are still used today. 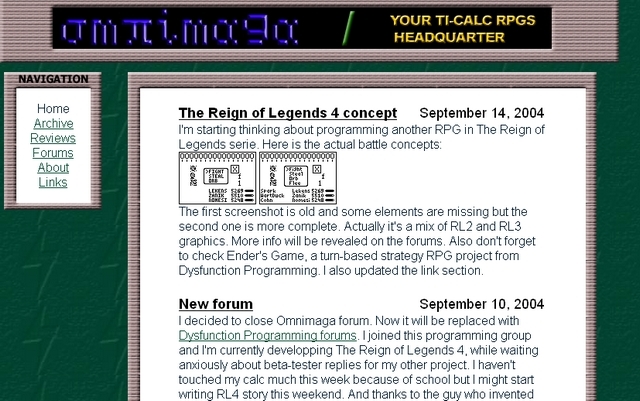 Several TI-83 Plus BASIC RPGs such as the Illusiat, Mana Force and Reign of Legends series came out under the original programming team, although other members only participated in 3 of them. 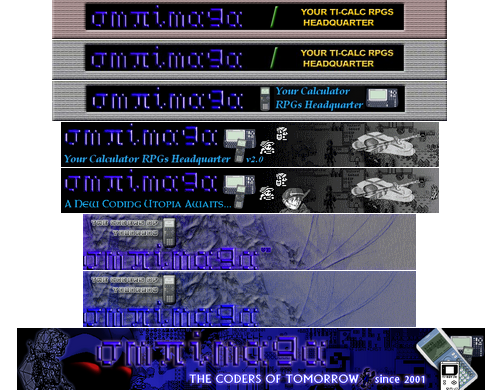 In March 2004, Omnimaga finally got its first website, hosted on yAronet, then later the "Calculator RPG Headquarter", a site dedicated to TI (and later other brands) RPGs, was created, associated with the Omnimaga name. 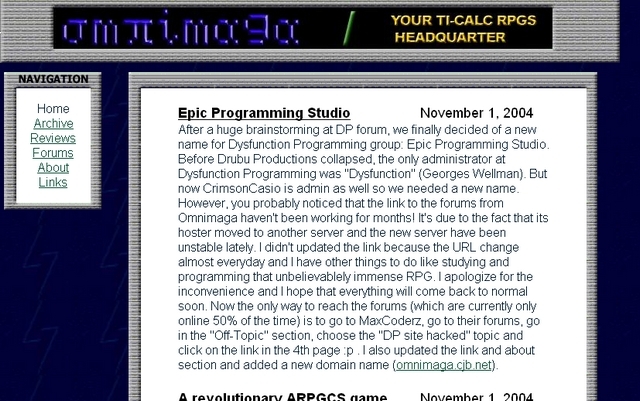 In September 2004, after lack of activity, the team and forums were disbanded then Omnimaga RPG headquarter became affiliated with Epic Programming Studio forums. Unfortunately, hosting issues caused the site, after having moved from an URL to another during half a year, to go offline for almost two months from December 2004 to January 2005. 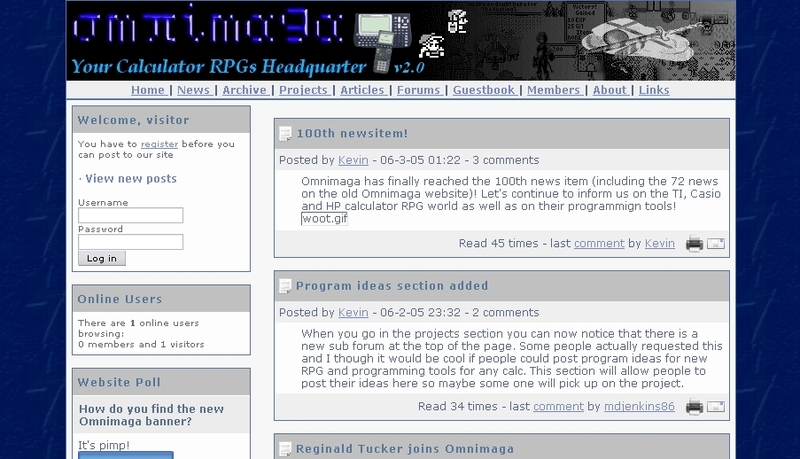 After finding a new host, Omnimaga RPG website reopened on February 1st 2005 then branched out towards Casio and HP role-playing games. The site finally started to grow in popularity afterward. 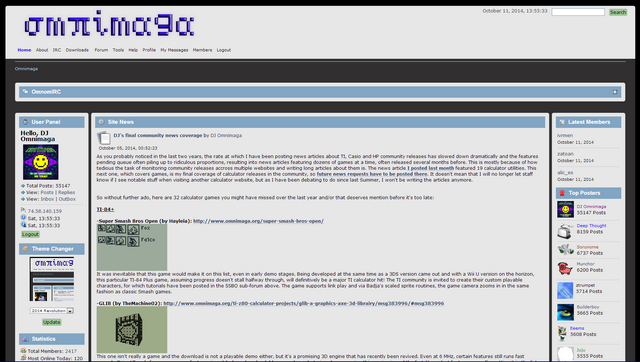 In May 2005 the site was moved to Invisionfree and the entire content was integrated into a forum system with a portal, with the ability to comment on news items and discuss community RPG projects. After requests from members and in response to TI community hostility incidents at the time, an entire new forum was opened again, which, unlike on yAronet, had much higher activity. An IRC channel called #omnimaga was also created. After the demise of Epic Programming Studio team in December 2005, the founder of Omnimaga started a new programming again, this time with online users. The site slogan was then changed to "A New Coding Utopia Awaits". The team (which got the "Coders of Tomorrow" name a few months after its creation) and the forums had great success and many programs such as Metroid 83+ and Metroid II: Evolution were released under Omnimaga name during the first half of 2006, but staff disputes and inter- community disputes caused stability problems at Omnimaga for the rest of 2006. The site had a slow growth period for the first half of 2007, but then picked up again that Summer after DJ returned from a long period of inactivity due to lack of Internet access. Despite the high site activity after Summer 2007, the TI community started showing signs of weakness and there was an increasing amount of inter-community problems, which were mostly indirect attacks towards Omnimaga and its way of operating. Eventually it started to hurt the site userbase and lead to Omnimaga demise. 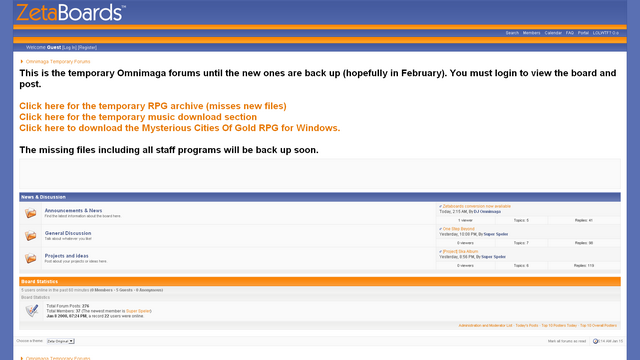 After the site closer in early 2008, the IRC channel remained online as a music producing channel and there were plans to open a site dedicated solely to the music that was present on Omnimaga website and future songs by former staff, but with no affiliation with the TI community. At the end of Summer 2008, a few former Omnimaga staff started suggesting that Omnimaga restarts from scratch as a calculator website. Initially the founder was not interested, but he changed his mind after an increasing amount of interest towards the site and programming revival. On August 25th, a new site started on 1and1 hosting and a new forum system and on Omnimaga 7th anniverary, the official re-opening occured. Despite the re-opening having never been officially announced anywhere, the new forums activity still managed to reach levels similar to the most active TI forums at the time, partly due to the overall TI community inactivity. However, the new Omnimaga became the home of several major projects like F-Zero 83+ and TI-Boy SE, as well as a programming contest, which caused the site to pick up in popularity again. During 2009, there was a resurgence in hostility on certain other sites, which, unlike in 2006-07, caused certain users to migrate to Omnimaga, as the site was meant to be free of hostility, and those people did not want another "2008". This, combined with the arrival of major projects like Axe Parser,major breakthroughs in the TI-Nspire scene and our revived focus towards TI community development news afterward, caused Omnimaga popularity and activity to start increasing exponentially. In late 2010, we moved from 1and1 to a faster hosting provider, Aspiration Hosting, then after the arrival of the fx-cg10/20 calculator models (Casio PRIZM) Omnimaga forums branched out towards Casio development and had success in that area. 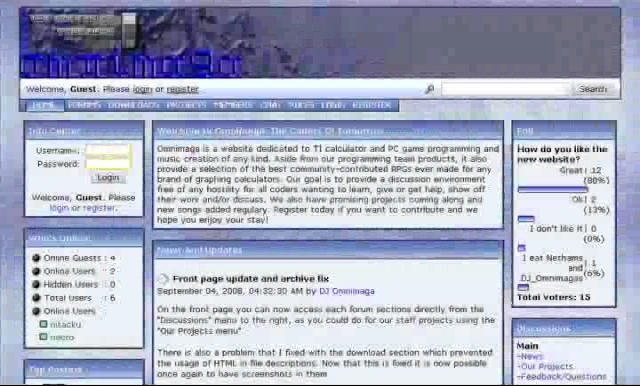 The site also became the home of Ndless, the tool that allows ASM and C programs to be ran on TI-Nspire calculators, and the forums branched out towards computer programming and web development as well. On September 1st 2011, Omnimaga will exist for a decade and its new incarnation didn't lose the game yet, unlike the past ones, and it seems that the site is destined to continue having success in long terms and that the team will never give you up in the calculator programming scene. Below you can see the many Omnimaga banners that got used on our website from April 2004 to February 2014. The second one is from September 2004, the third one February 2005 and the fourth one May 2005. The slogan was changed to "A New Coding Utopia Awaits" after the online programming team started in December 2005, then to "The Coders of Tomorrow" in April 2006 (the same name as the team). The same banner was used on the new site in 2008, but got rid of the v3 text. The last banner is the last one used until the site switched to a simple logo banner.